Professor Gephart has served as a guest conductor, clinician, lecturer and adjudicator both nationally and internationally having conducted All-State Bands in Indiana, Virginia, Colorado, Arkansas and Kentucky. He has served as a clinician at the Midwest International Band and Orchestra Clinic in Chicago and at numerous conferences and in-service workshops. In 1997, he was selected to conduct the music camp honor band for the Department of Education in the Northern Region of Queensland, Australia. In his career he has been the recipient of many awards and honors including the Indiana Outstanding Bandmaster Award and the Purdue University New Professional Award. He has commissioned numerous works for wind band, including “Anthem” by Steven Bryant which was premiered in 2011 celebrating the 125th Anniversary of Purdue Bands. 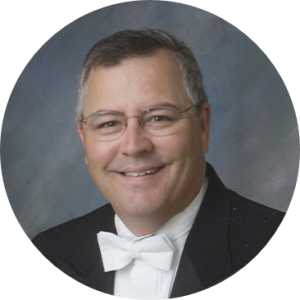 Most recently he has served on the faculty of the American Band College in Ashland, Oregon and serves on the ABC Board of Directors.